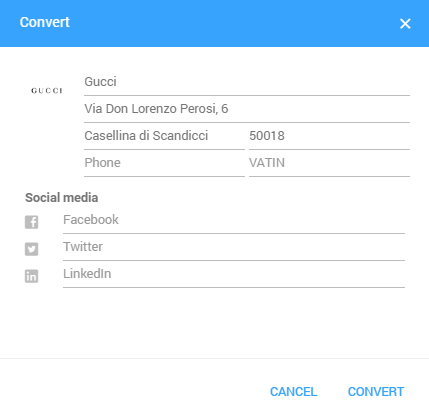 You can integrate your account with Linkedin in your account’s settings. Thanks to this integration our system will automatically fill the additional information about a new company in your database. Click on this link: https://app.instream.io/settings/connected-accounts, to go directly to your account settings. You can also open your account’s settings on the platform by clicking on your avatar. Click on the first “connect” button, next to the “Connected with Linkedin”. The system will connect your account automatically after you will accept to give access to our system to your public information and e-mail address. Now you can benefit from Linkedin integration while adding a new business contact to our database. You just need to type the name of the new organization, the rest will be downloaded automatically.